We live in an Ice Age World, and have been so for several million years. We have measured evidence that for 85% of the last half a million years the Earth has been a virtual Ice Planet, with a climate so cold that the lands outside the tropics become essentially uninhabitable for human populations, and the lands within the tropics become uninhabitable for the lack of water. This means that what we regard as our normal climate, is actually an anomaly that makes up only 15% of the overall timeframe. 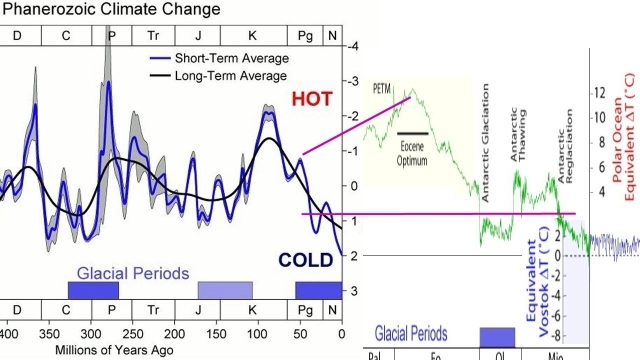 The climate anomalies interrupt the 'normal' glaciation climate in roughly 100,000-year intervals with nicely warm interglacial holidays, like the one that we presently enjoy - a period of easy living with a strong Sun and plenty of rain for agriculture. This means that for the long times in-between the interglacial holidays, the entire Earth is largely uninhabitable by today's standard. Numerous measurable forms of evidence tell us that we are about to get back to that. 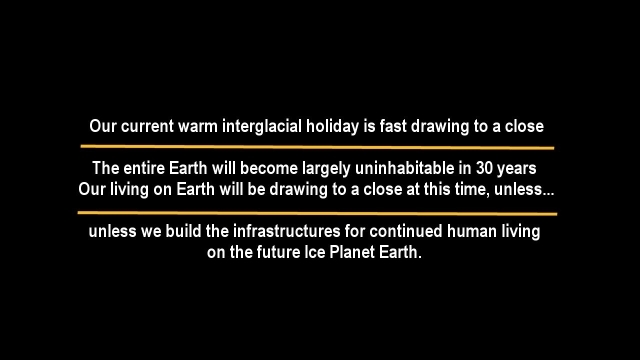 It tells us that our current warm interglacial holiday is fast drawing to a close, and with it our living on Earth is drawing to a close, unless we build the infrastructures for continued human living on Ice Planet Earth. Our current warm interglacial holiday is fast drawing to a close. Our living on Earth will be drawing to a close at this time, unless we build the infrastructures for continued human living on the future Ice Planet Earth. The principles of the universe do not fail. The Ice Age does not fail to resume by its principles. Neither should we fail to respond to its challenge, because no doom awaits us then. The challenge is to create us a secure platform for our continued living on this planet. 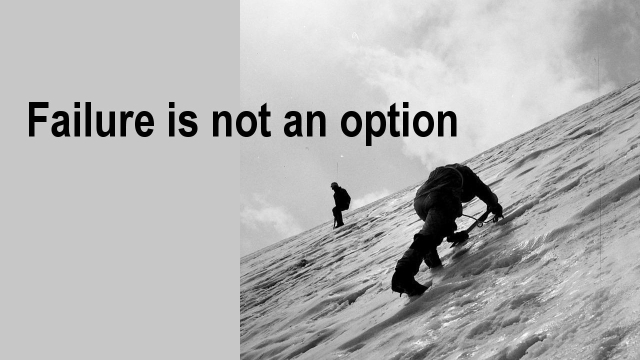 To fail in this endeavor is NOT an option. It is NOT an option for humanity to choose not to have a future. To choose our near extinction by failing to respond to the needs of the future is not a valid option. Failure is not an option for both, humanity and the universe. Failure is not an option here either. And yet, we, humanity, intend to fail. We are a mere 30 years away from the entire planet becoming uninhabitable, past the phase shift to the next Ice Age glaciation period. We know this, but in total defiance of this knowledge we play silly games as children would, games of nuclear weapons politics, regime change terror wars, and food burning in a starving world. Our commitment is to follow this recipe of failure. This is what we cannot afford. The evidence tells us that the next glaciation period will potentially begin sometime in the 2050s timeframe, or sooner. Why is humanity so staunchly not responding to this absolute greatest danger in the entire history of its civilization? At the time the Earth reverts back to being an Ice Planet, as it has been for 85% of the last million years, the associated consequences will bear down on human living without fail. Should we choose not to be prepared for the consequences, as is presently the case, we choose suicide by default. The Ice Age consequences are enormous. They have never before been experienced in all the history of civilization, nor are they imaginable. It is unimaginable that Canada, Europe, and Russia will become uninhabitable by intense cold, snow, and ice in 30 years, simultaneously, as will all places outside the pink zone. It is likewise unimaginable that the rest of the world will become uninhabitable, too, as it looses 80% of its rain. That's when 'The 'coach' becomes a pumpkin,' as in the Cinderella story. Society, presently turns away from its future and shrugs. Atlas shrugs. The giant that humanity is, shrugs, instead of putting the spate in the ground to build a new world for itself that is fit for human living on an ice planet. Humanity is presently asleep. It is dreaming of global warming, endless summers, the glory of war, profits from slavery, power by terror and corruption - the dreams that the system of empire has prescribed for society like a drug. 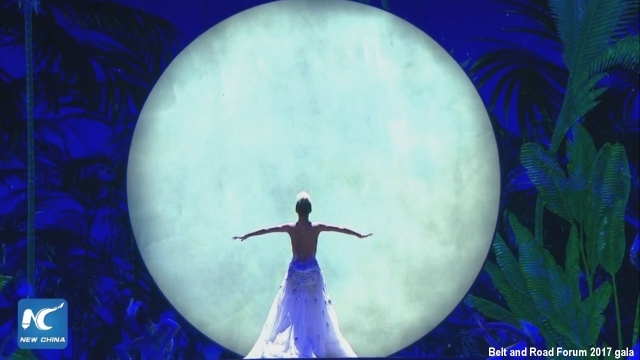 This dreaming is what society imagines determines its future. In this dreamland the boundary blurs between fiction and reality. Reality becomes fiction, and fiction reality. We even educate our children with fairy tales. We tell them that the coach becoming a pumpkin at the stroke of midnight will never happen in reality. The opposite is true, isn't it? When markets crash, lies are exposed, governments fall, bubbles burst, illusions evaporate, the sky-castles of dreams end up to be but a 'pumpkin'. The 'glory' of the endless interglacial holiday, is one of those dreams. When children grow up, we teach them in the universities how to build investment portfolios that never collapse, but in the real world they soon discover that their 'investment' becomes somebody else's profit in a rigged game in which they, as all but a few, end up with empty bags. We teach the children that financial speculation builds economic stability, war creates security, democracy assures prosperity, and that the Apollo moon landings have been just Hollywood productions. We even say that Osama Bin Laden had orchestrated the bombing of the World Trade Center in New York, successfully, right in the midst of the most defended air space in the world, all single handed from a cave in Afghanistan. We teach our children, and one another too, the dreams we like them to have, day dreams of golden coaches, including that the Sun isn't what it really is. 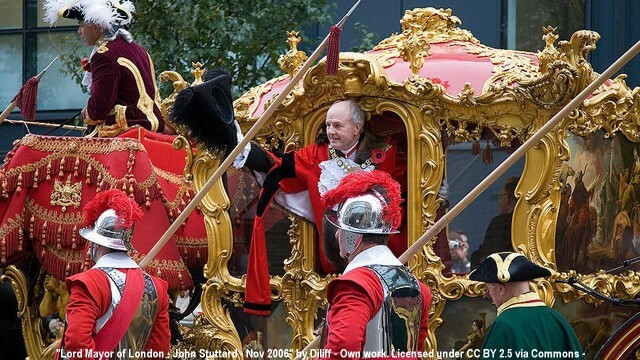 Modern society loves to be entertained with fairy tales. In this context the Ice Age is a forbidden subject. Reality is forbidden. Evidence is forbidden. Most people are carefully taught not to believe in evidence anyway, but to believe in their dreams with "strong confidence" and unshakable convictions. That's the modern landscape. That's why the most thoroughly educated people still believe in the hydrogen Sun. 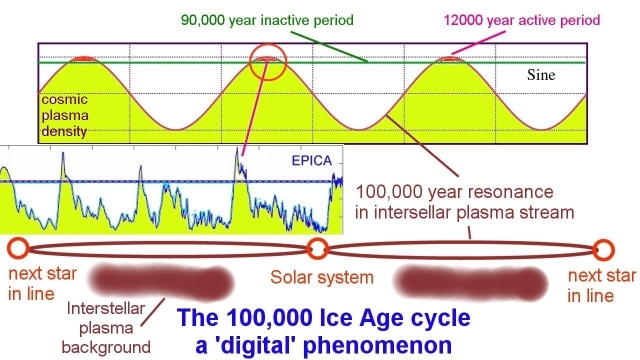 Some even believe that the Ice Ages are caused by orbital cycles. 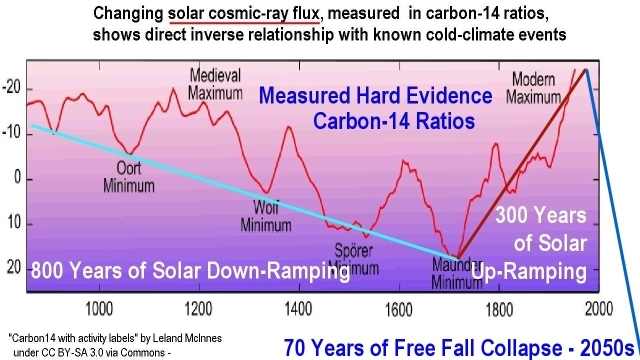 Some believe in CO2 global warming, obediently. Some also believe in winning the lottery. Some people even believe in Adolf Hitler who is long dead, and in Wall Street that is nearly dead, and in nuclear war by which everyone will be dead if it comes to that. But when it comes to the Ice Age glaciation starting anew, and its deep consequences that no one can escape from, society shrugs. People say, that the Ice Age is esoteric stuff that nobody believes in, or ever would. No university teaches anything real on the most critical subject in the world that everyone is affected by. Indeed, they wouldn't dare to teach what is real, even if they knew it, because reality is a forbidden subject. No university dares to acknowledge what the most advanced science discoveries have laid onto the table. Society is protected from the discovered reality, because by exposing it empires would fall. But some people do dare to break the shell. 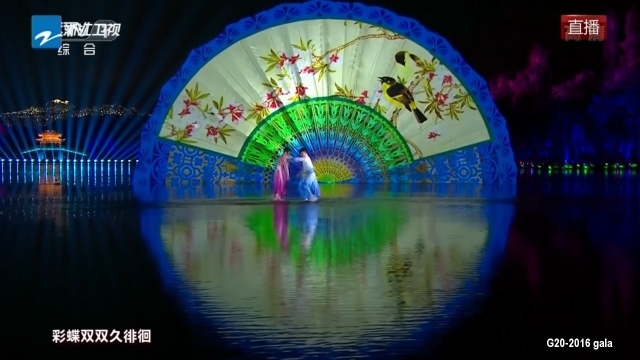 Some dare to dance on the waters that all others avoid. Some dare to say, we can do what it takes to face reality and win, even if this seems impossible. Just imagine that universities would dare to acknowledge the Ice Age reality, such as, that the entire planet becomes uninhabitable in 30 years time, unless the technological infrastructures are built to make our future Ice Planet a livable world for 7 billion people and a lot more, by living on the sea along the Equator. That's unheard of. Can you imagine further, the consequences for empire when reality was acknowledged, and for the societies it controls? All the dreams and believes of much of the world would go out of the window when reality would be acknowledged. The world would become transformed by people daring to live outside the cage. A new age would begin, an age of defiance, an age without empires, wars, nuclear war terror, and a whole lot more. The changes in the world would be so extensive, and be so revolutionary, that no one has had the courage yet to turn the page from tradition and cultivated impotence, to reality. 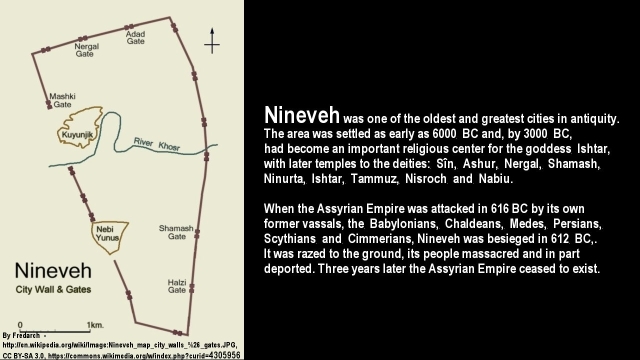 Nineveh was one of the oldest and greatest cities in antiquity. Ninurta, Ishtar, Tammuz, Nisroch and Nabiu. 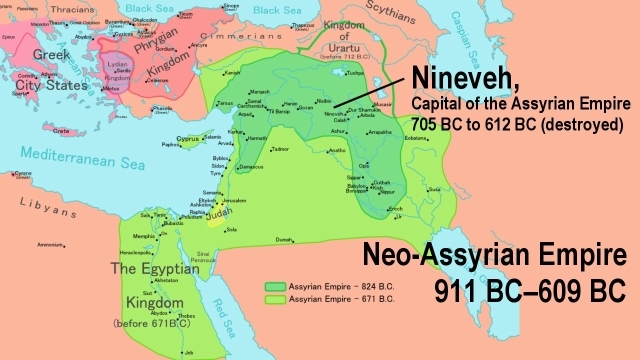 Scythians and Cimmerians, Nineveh was besieged in 612 BC,. deported. Three years later the Assyrian Empire ceased to exist. The conflict between reality and prescribed perception, apparently, is not a new phenomenon. The conflict goes back in time a long way, though on a smaller scale than today's. Way back in time somebody had written an allegory about a great challenge. The allegory is focused on merely saving a city from the consequences of its folly, not the entire world. The story was written in early time and had apparently been judged so important, because of events at the time, that it had become one of the books of the Christian Bible. I am referring to the Book of Jonah. 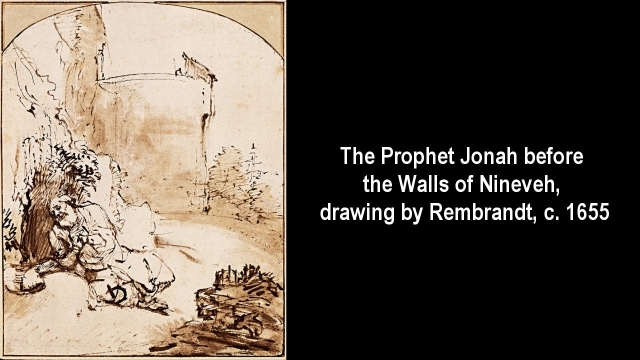 The allegory is the story of a man named Jonah, who is ordered by God to go to a certain great, but evil city, the city of Nineveh, and wake the people up there, because the city is in great danger on the course it is on. Of course, Jonah is afraid. The task looms enormously large. Nor is it to his liking to save a notoriously evil city. Jonah decides to solve his problem by escaping to a far away place. He buys passage on a ship bound for Tarsus, a long distance away from Nineveh. But God doesn't let him off the hook. He casts a great storm upon the sea, so much so that the ship is about to break. 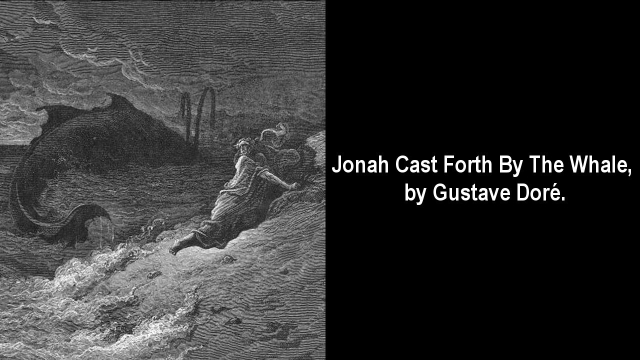 When Jonah realizes for whose fault those many people in the ship were about to perish, he requests the shipmates to throw him overboard in order that the ship would be saved and their life with it. As they shipmates comply, reluctantly as we are told, the storm does indeed cease. But God doesn't let Jonah off the hook with this attempted self-sacrifice either. He prepares a great fish that swallows up Jonah and deposits him unto land. 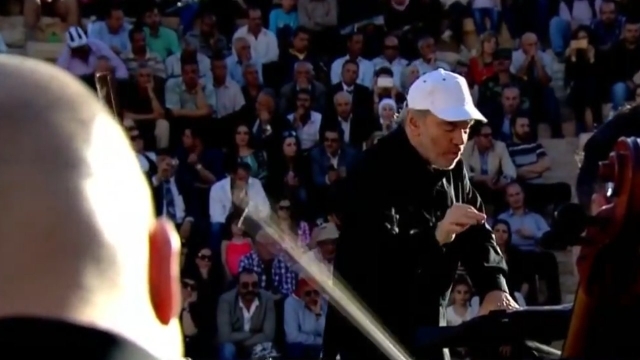 "Are you now ready to go to Nineveh to wake everybody up?" God asks him. This time Jonah complies, and goes to the city. 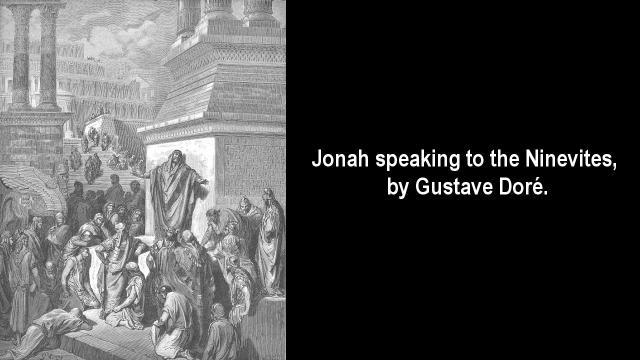 Jonah goes to the city and warns the people within it as he is told. To his surprise he finds the city responding to his word, and repenting. Thus, the evil city is saved. Of course, Jonah doesn't like the outcome of an evil city being spared its doom. He leaves the city and builds himself a shelter outside of it, from which to observe what might yet happen to the city. Might it yet be destroyed? He grumbles his displeasure before God, saying that he would rather die than to see an evil city escape its vengeance due. In order to console him, God creates a gourd that gives him shadow from the Sun while he sits and waits. Jonah is pleased with it. But on the next day God creates a worm that kills the gourd, and stirs a dry east wind that causes the gourd to whither away. Jonah responds angrily. He responds with sadness for the gourd. God asks him how it is that he grieves for a gourd but has no concern about the fate of an entire city of people. There may have been 100,000 to 150,000 living in the city of Nineveh at the time. God may have urged him to go back into the city, because a great feast would await him there if he did, a feast for the heart - a city of once small-minded people waking up to what it means to be a human being. The Jonah story in the Bible doesn't have this ending included, though it appears to be implied. God also may have said to Jonah in the beginning that he had a great feast in store for him in Nineveh. Perhaps, if Jonah had realized how great a feast for the hart he had been invited to be apart of, he might not have tried to run away from the task to bring it about. The story, as any well-written allegory, sets a mirror before us. Most people regard the Ice Age challenge, which they do not understand, if they regard it at all, as a foreboding of doom that they would rather run away from, instead of seeing it in terms of a great feast of good, which it offers to humanity. Society today, is like Nineveh was. It is awash with systems of empire and the corresponding evil of small-minded thinking in which society is barely alive. Ah, but there is this potential in the air for a great feast of good unfolding, should humanity wake up from its slumber and morbid dreaming. The Ice Age challenge should be seen as a bugle call to humanity, to wake up to its inherent potential, by which it really lives. This feast for the heart, which is called-for in this Ice Age case, involves the the building of a completely new world with a highly elevated platform for living. For example, the Ice Age imperative requires humanity to build itself 6,000 completely new cities for a million people each. They would need to be build afloat across the equatorial seas. This huge infrastructure could be manufactured with such ease in automated industrial processes that all the houses as infrastructures for living would be provided by society to one-another for free as an investment by society into the greatest asset that a society has, which is itself. The resulting world would be debt free, poverty free, rent free, spacious, and be of the highest quality. It would include whatever is required to maximize the development of the human potential. It would be a feast for the heart indeed. This feast would revolutionize finance, economics, politics, cooperation, and human living. 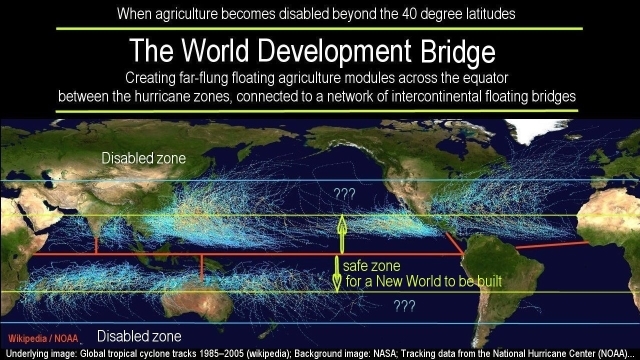 All the farming associated with the new floating cities, would be done in scientifically optimized indoor facilities, operating with enhanced sunlight, enhanced atmospheres, and freshwater flowing directly out of the oceans by means of deep-ocean reverse-osmosis, desalination. And this would be just the beginning. It would revolutionize construction, industrialization, and even energy systems. Once humanity pulls itself out of the small-minded world, into the real world, all limits simply fall away. Imagine free healthcare, free education, free food, free housing, free transportation - in short, debt-free living. This is the potential that we need to awaken ourselves up to. It is a potential that is powered by our love for one-another as human beings. There are many ways to be small-minded. And there are many ways to awake from the small-minded dream and come to life again. This happens to people when they are inspired by scientific facts and scientific recognitions, by which they come to life again. The Ice Age challenge that lifts us out of our dreaming can have this effect. Ironically, very few people have any idea of what got us into the current Ice Age trap to begin with. 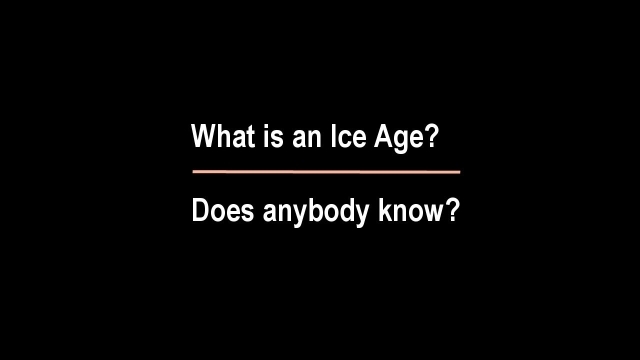 What is an Ice Age? Does anybody know? 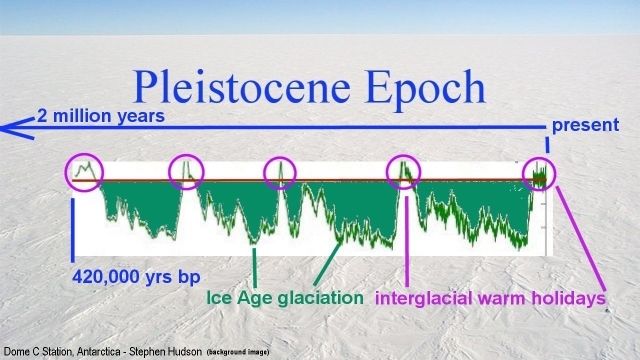 Ice Ages are quite rare on the Earth, in the long sweep of the history of life on our planet. The climate that we have on Earth reflects the dynamics that affect our galaxy as a whole. Contrary to general perception, galaxies are not self-existent and self-powered. They are powered by vast intergalactic plasma streams that flow through the galaxies. The intergalactic plasma streams flow between galaxies in large plasma networks that pervade intergalactic space. The intergalactic plasma streams combine the galaxies into functionally interconnected cosmic structures. By plasma consisting of electrically charged particles, the organized plasma streams have an internal resonance that is largely determined by their physical length. In a piano, for example, the tones of its sound are determined in part by the length of its strings. Longer strings resonate at longer vibration-cycles than shorter strings. 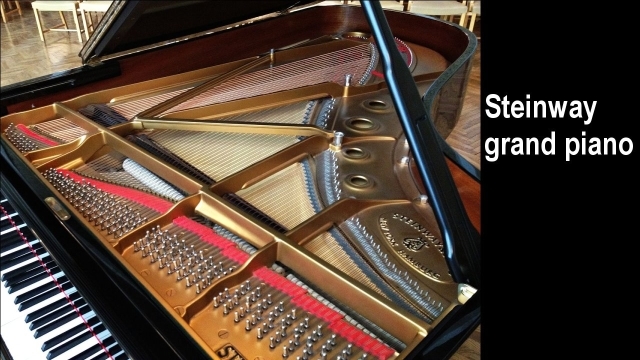 The piano tones are typically measured in hundreds of cycles per second. 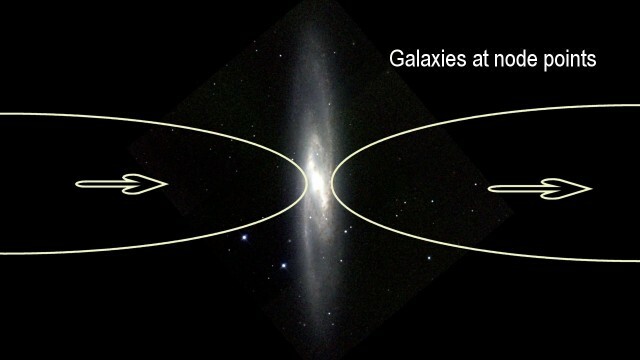 In the cosmic environment where the distances that separate the galaxies are enormously large, measured in the range of millions of light years, the electric resonance cycles that occur in the very long interconnecting plasma streams, have correspondingly long resonance cycle times. While the piano tones are measured in cycles per second, the intergalactic 'tones' are measured in millions of years per cycle. 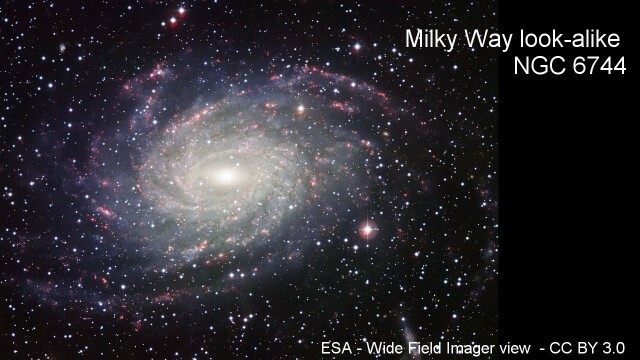 The two resonance effects that affect our galaxy, the Milky Way Galaxy, and thereby affect the Earth's climate, have been measured to be roughly 31 million years in duration, for the short cycle, and 150 million years for the long cycles. 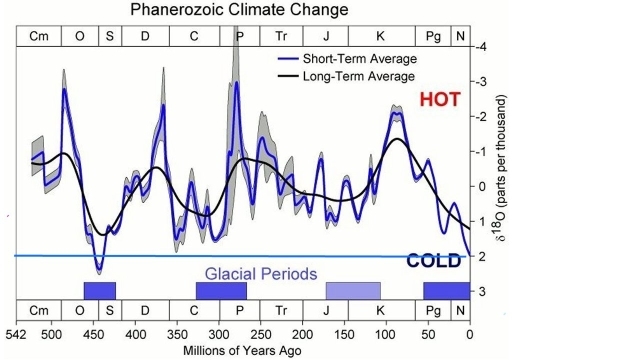 The combination of the two resonance cycles is evident in the Phanerozoic Climate History on Earth, shown here. The graph covers the period of life on Earth going back in time 500 million years. One can see two very long climate cycles clearly evident in the physically measured long-term climate history on Earth. The Earth's climate history can me measured in ratios of a heavy isotope of oxygen, termed Oxigen-18, in samples from historic times. The O-18 isotope is an atom of oxygen that has two extra neutrons attached, which increases the weight of it. The difference in weight affects the rate of evaporation of water molecules at different temperatures. 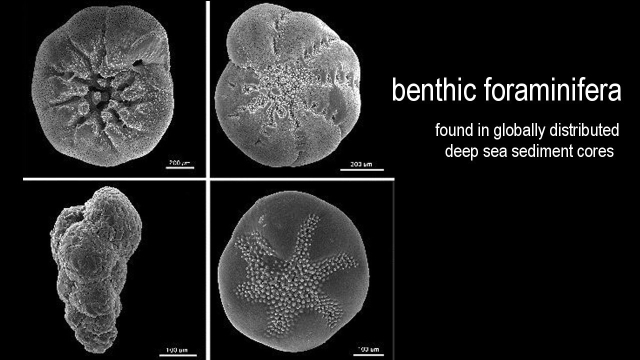 The climate record that you see here is measured in O-18 ratios that have been preserved in deep-sea sediments in the form of calcite shells produced by microorganisms. Since the calcium carbonate of the shells was formed by combining water and carbon dioxide from water, the organisms have locked into their shells the prevailing ratio of heavy oxygen at the time the organism had lived. 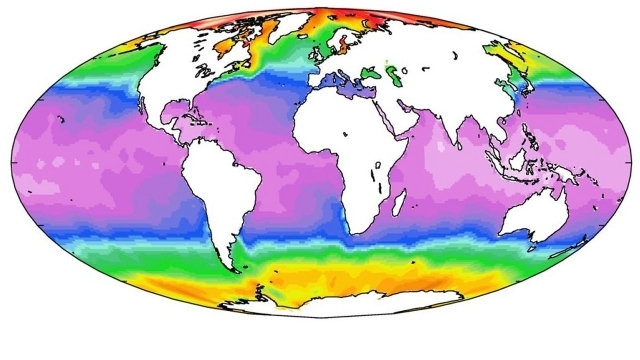 Since sea water molecules that contain heavy oxygen evaporate at different rates at different temperatures, in comparison with normal water, the oxygen-18 ratio presents itself as a highly reliable proxy for measuring historic temperature patterns as far back in time as 500 million years. 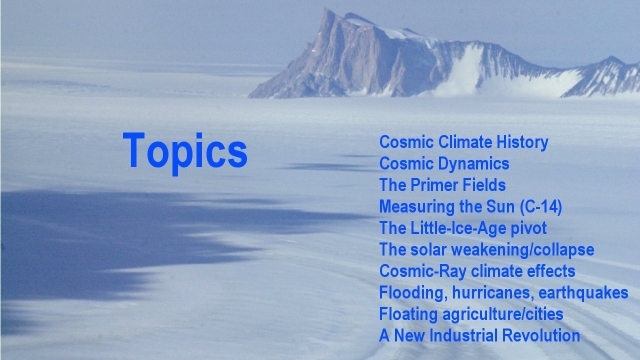 The existence of the 31 million years resonance cycle, and the 150 million years resonance cycles, has been discovered in this laboriously reconstructed climate record. The cause for the long cycles had been the object of much speculation until quite recently. 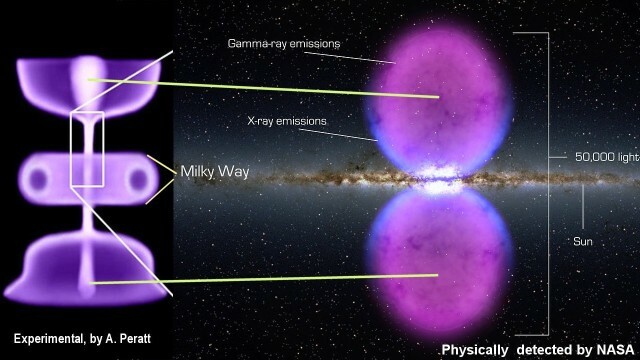 At around 2010, when data from NASA's Fermi Gamma-ray Space Telescope was analyzed, the existence of two gigantic structures were noted, that are visible in gamma-ray light. 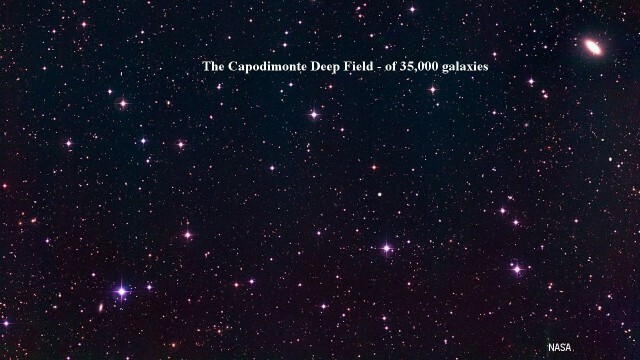 The discovered structures extend above and below our galaxy's center, each spanning 25,000 light years, the equivalent distance of half the radius of the galaxy itself.. 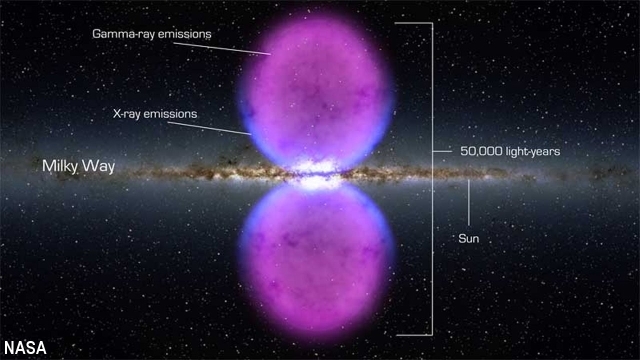 The geometry of the discovered large plasma structure associated with our galaxy, is typical for the geometry observed in plasma-stream node structures generated in laboratory experiments. The image shown here on the left was observed in plasma-flow experiments conducted at the Los Alamos National Laboratory in the USA, by Anthony Peratt. The experimentally derived form reveals the existence of two large plasma confinement domes that magnetically contain high concentrations of plasma above and below the experimental node structure. The discovery of this same basic geometry on the galactic scale provides visible proof that our galaxy is not its own master, but exists at a node point between two intergalactic plasma streams, by which, in essence, the galaxy is powered, which in turn powers its roughly 400 billion stars within it, including our Sun as one of them. 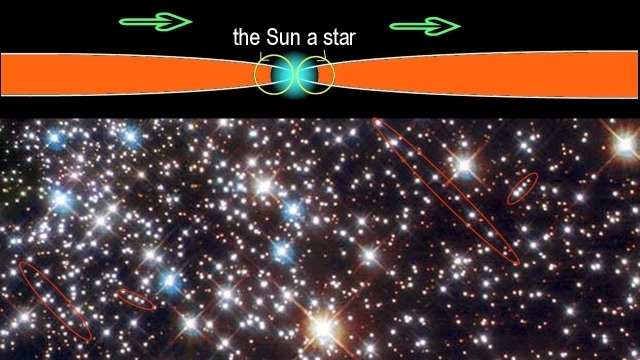 It has been long suspected that just as our Sun, as a star, exists at a note point. in a string of interstellar plasma streams within the galaxy, by which the Sun is powered in the same manner that all galaxies in the universe are powered, by a common principle. 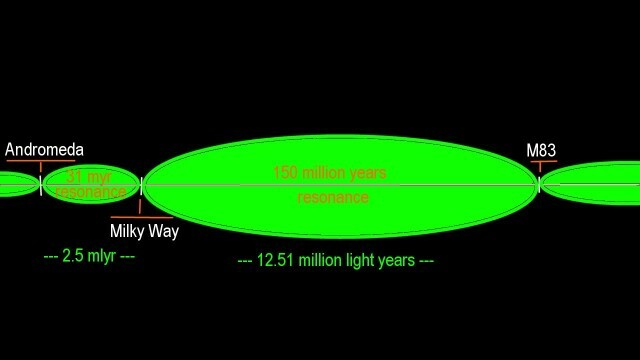 As I said earlier, the relative distances of two potential neighboring galaxies shown here, as an example, all in right proportion to create the 31 and 150 million years resonance cycles that we see in the climate record. NASA's discovery takes the theorized concept further out of the theoretical, and places it into the realm of a reality for which proof now exists. It deserves to be repeated that the proof lies in the geometry of the discovered galactic structure. 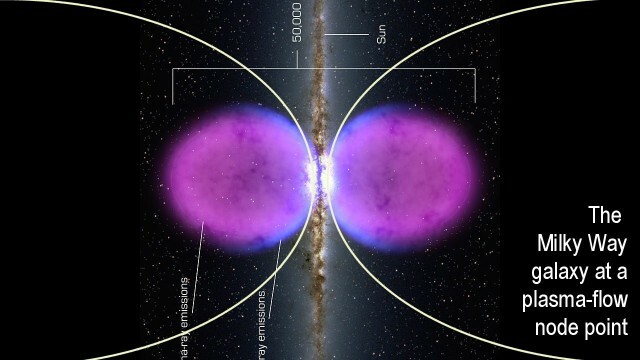 The geometry that has been discovered in the very-large, extending above and below our galaxy, matches the geometry discovered in the very small, in high-energy plasma-flow experiments conducted at the Los Alamos National Laboratory. 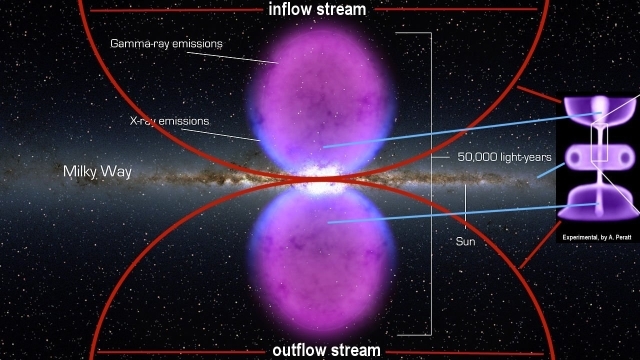 It proves that our galaxy is a part of a high-volume plasma-flow structure. 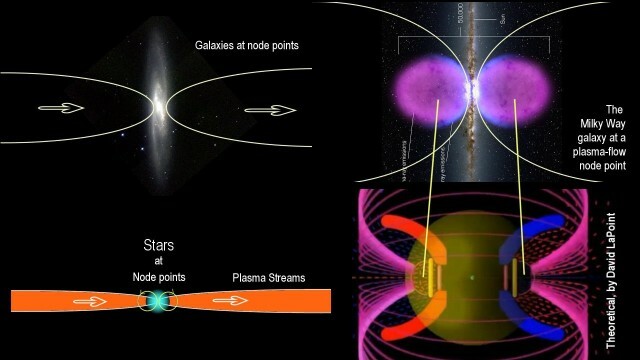 It also proves that the resonating density in the plasma streams that connect up with our galaxy, is reflected throughout the galaxy and affects thereby the density of the plasma that powers all stars, including our Sun. These considerations proof that the roller-coaster-like historic climate record on Earth, has its origin in intergalactic space, with effects that affect the intensity of our Sun. 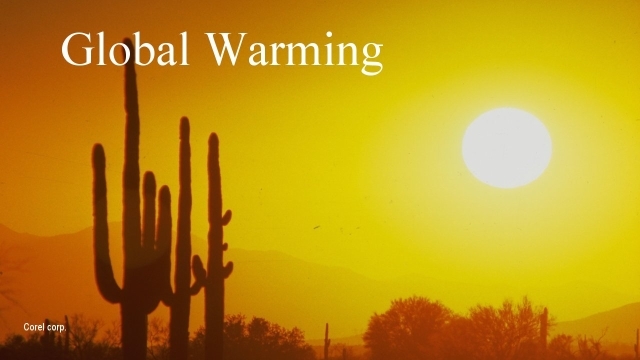 This means that the historic climate record on Earth stands as a proxy for the cyclical variations in solar activity, which in turn are evident in the changing climate on Earth. The discoveries also prove that the principles that we see reflected in the climate record on Earth will continue to be expressed. And they are expressed in the Ice Age phenomena as a part of the expression of the changing galactic climate reflected in a lawful manner.. When we expand the the last 50 million years of the long historic climate record, some rather dramatic effects come to light, associated with some of the little downswings and upswings in the climate record. 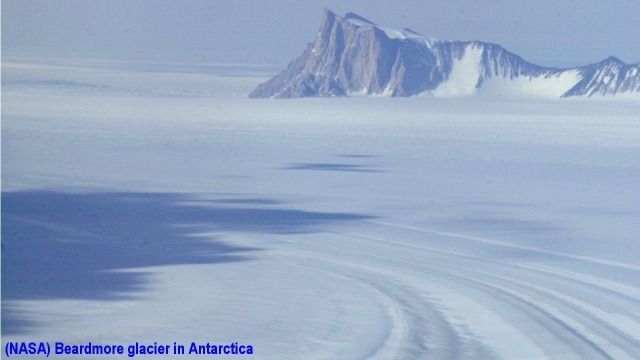 One effect that we see here is that Antarctica froze up roughly 35 million years ago, then thawed out again, and froze up once more around 15 million years ago, and remained frozen thereafter with the Earth's climate continuing to cool. Now, if we expand the last 5 million years of the climate record still further, we see that from a point on, enormously deep climate fluctuations began, and that these fluctuations are getting progressively larger. Here we see the beginning of what we call the Ice Ages. The dawn of humanity coincides closely with the startup of the Ice Ages. This fact is important, as I will explain later. 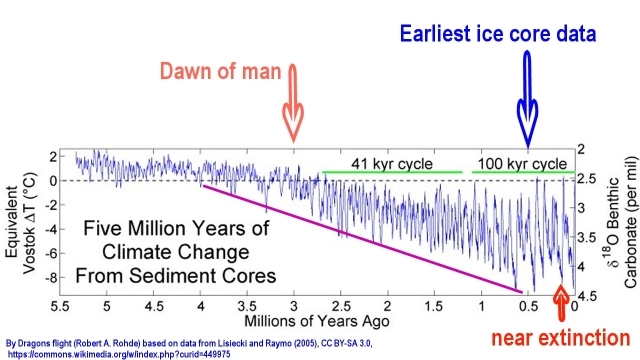 For now, if one looks at the big climate history of the last 500 million years, one will note that the conditions at which Ice Ages occur are quite rare in time. This tells us that the galactic environment for the Sun is presently at the weakest state it has been in 440 million years. The galactic environment has become so weak, that the plasma density flowing into our solar system frequently drops below the threshold needed for plasma to be densely focused onto the Sun. 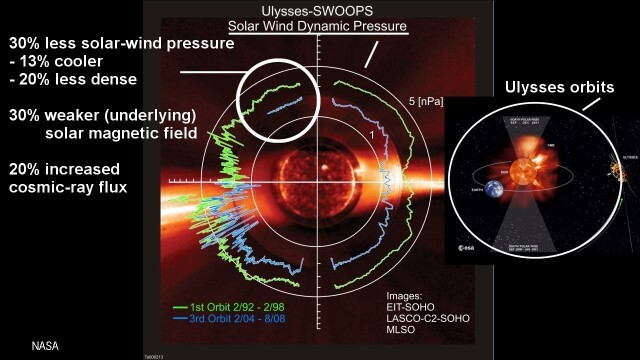 The plasma compression around the Sun is accomplished by an electrodynamics process that forms primer fields for the concentration of plasma. When the dynamics are not achieved for the fields to form, the Sun falls back to a low-powered state that reflects the prevailing default level of plasma density in the solar system. At this point, under the low-powered Sun, deep glaciation conditions occur on Earth. If we look at only the tail-end of this long train of Ice Ages, the one that we also find embedded in the ice sheets of Antarctica, we encounter that the near extinction of humanity, that archeology believes occurred around 160,000 years ago, coincides with the deepest and longest period of cold of the previous Ice Age.